The National Cathedral in Washington, D.C. is a special place to visit year-round, and especially memorable during the Christmas season for its colorful yet classy holiday decor and its special concert and events series. Throughout the month of December, you can take a guided tour, hear festive music, make Christmas decorations, or attend a religious service this year. However, you should plan ahead to attend events during the holiday season as many of them require advance tickets. The Washington National Cathedral is located at 3101 Wisconsin Avenue Northwest in Washington, D.C. The nearest metro station is Tenleytown-AU station, which provides easy access to downtown D.C. and various other tourist attractions nearby, and you can also park in a garage located at Wisconsin Avenue and Hearst Circle if you plan to drive. The world-famous Washington Cathedral orchestra, chorus groups, and bands offer a full lineup of holiday performances throughout the month of December. Saturday Carillon Recitals: Cathedral Carillonneur Edward M. Nassor leads a thirty-minute recital after Saturday sermons starting at 12:30 p.m. Best heard from the Bishop's Garden. Advent Lessons and Carols: A traditional service sung by the Cathedral Chorus on Sunday, December 2, 2018, at 4 p.m. Includes scripture readings, seasonal hymns, and choral anthems. "Messiah" by G.F. Handel: On Friday to Sunday, December 7 to 9, 2018, the Washington National Cathedral Choir and Baroque Orchestra will perform Handel's "Messiah" at the Washington National Cathedral. Advance tickets are required and range in price from $25 to $95. Weekday Evensong: On December 13, 2018, you can join the general congregation at the Washington National Cathedral for a special service of Choral Evensong performed by the Boys Cathedral Choir at 5:30 p.m.
Cathedral Choral Society's "Joy of Christmas" Show: On Saturday and Sunday, December 15 and 16, 2018, you can celebrate the season with a concert conducted by Steven Fox featuring Christmas favorites and a carol sing-along composed by Paul Moravec. A Gospel Christmas: On Friday, December 21, 2018, you can join the Cathedral Band for a special jazz, blues, and gospel-infused service about the Christmas story. Gold: Christmas With the King's Singers: On Saturday, December 22, 2018, at 7:30 p.m, celebrate the 50th birthday of the King's Singers ensemble with a medley of their greatest hits, including a number of Christmas classics. Christmas Day Organ Recital: At 1:30 p.m. on Christmas Day, you can enjoy a performance by the Washington National Cathedral organist George Fergus of traditional and familiar holiday favorites on the church's great organ. Although not all concerts require tickets to attend, most request a suggested donation of between 10 and 20 dollars to support the church and its various holiday programs. Be sure to check each event listing for more information on ticketing and performance specifics. Taking a tour of the National Cathedral is a great adventure any time of year, but you'll especially enjoy the hallowed halls of this historic church when its decorated for the holiday season. Throughout the month of December, the Washington National Cathedral offers a variety of tours, including a behind-the-scenes tour and one that ends with a tea service inside the cathedral. The 90-minute Behind-the-Scenes tour features access to some of the cathedral's many secret passages and stairwells not normally available to the general public and takes place on various dates throughout the holiday season. The tour costs $27 per adult and $23 for children over the age of 11, seniors over the age of 65, students, teachers, and military personnel (with ID). For a special treat, you can join the Tour and Tea trips on Tuesdays and Wednesdays throughout the month. 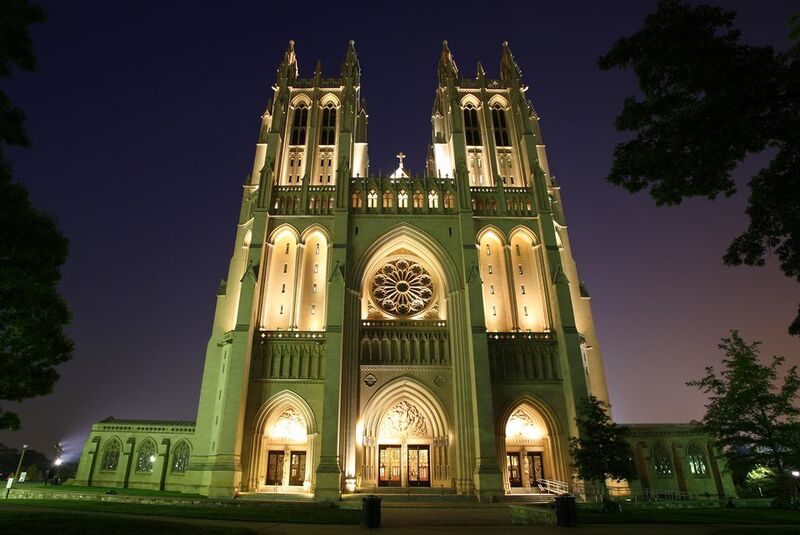 During the tour, you'll enjoy an in-depth look at the cathedral followed by tea with a scenic view of D.C. The tour begins inside the nave at 1:30 p.m. and tea follows at 3 in the Pilgrim Observation Gallery. Special tour topics include stained glass, wrought iron, and needlework, and cost $36 per person. When it comes to celebrating the holiday season, it's important to remember the reason Christmas is important in the first place. Fortunately, the National Cathedral offers a variety of creative and unique sermons and services specifically about the Christmas story and "reason for the season" throughout the month of December. Special events this year include the Advent Lessons and Carols on Sunday, December 2, the "Family Messiah: The Christmas Story and Selected Highlights" performance on Saturday, December 8, and the Bethlehem Simulcast Prayer Service on Saturday, December 15, 2018. On Christmas Eve, Monday, December 24, you can also attend the Children's Christmas Service at 11 a.m. and the Christmas Eve Holy Eucharist service at 10 p.m. (passes required). On Christmas Day, all are welcome to attend the 11:15 a.m. Christmas Day Holy Eucharist (passes not required). Public services also take place on Sundays all month long starting with Rite I of the Holy Eucharist at 8 a.m. followed by Rite II at 9 a.m. (and again at 11:15 a.m. for the live webcast). Sunday services conclude with the choral evensong or evening prayer at 4 p.m. All are welcome to attend these public events. You can find unique holiday gifts at the National Cathedral Greenhouse, Herb Cottage, and Museum Store. The Greenhouse offers a wide selection of herbs, foliage, plants, gifts, and Christmas decorations. Books, music, statues, jewelry and other gifts can be found in the Museum Store, and the Herb Cottage is a gift shop featuring a variety of home and garden accessories, dried herbs, and specialty teas and foods. Alternatively, you could make your own holiday gift if you join the Knitting and Crocheting Ministry service, which takes place on the third Sunday of every month at 1 p.m. (December 16, 2018). Celebrate the Holidays in Georgetown, Washington, D.C.